When I bite into it: There’s an odd flavor. I guess that’s coffee. Kind of an instant coffee sensation (must be the combination of the flavor and the slight grainy nature of a homemade marshmallow. Then bits of cocoa nibs (the beans where chocolate comes from – texture like a coffee bean) hit me in the texture department. The marshmallow begins to melt away (but the nibs stay behind) and the weird coffee flavor gives way to sugary sweetness. First impression: This is a weird flavor. Tastes like: Coffee, but not in a good way. I’m kind of frowning as I eat this bite and type this sentence. Buzz: I can physically feel the caffeine affecting me at this point. 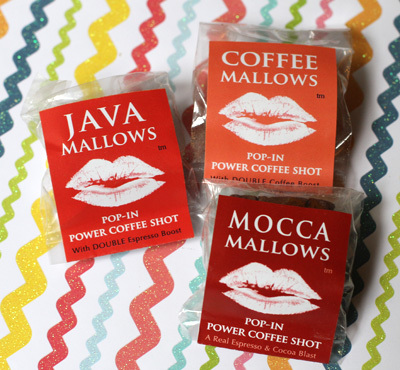 I ate half of the Mocca Mallow 10 minutes ago, and about 1/4 of the Java Mallow just now. This is significant because I am a regular coffee drinker. Tastes like: The mildest flavor of the three. No weird texture (nibs) issues. They still don’t taste good, though. 1. Gelatin: Ingredients include beef gelatin. On one hand, I am impressed that they include that info on the ingredients because I would think that means it’s a higher-quality gelatin (but I don’t know that for a fact, it’s just a feeling I have). On the other hand, I have never seen gelatin on packaging list what animal it is made from. I guess that means this confection is out for any vegetarians or vegans out there. If you are vegan, you have already ruled out marshmallows anyway. If you are vegetarian, where do you stand on gelatin? 3. Ingredients List: All the ingredients are things you have heard of and come in contact with in your own kitchen. This is a very good thing! 4. Kosher: These marshmallows (along with the beef gelatin) are Kosher certified. 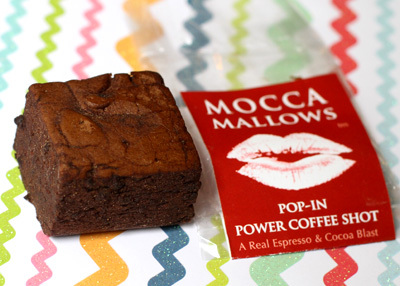 If you want a buzz, then CaffeMallows might work for you. Could be a good alternative if you are on a long road trip and you don’t want to drink a ginormous cup of truck stop coffee. Flavor-wise, I don’t love these.